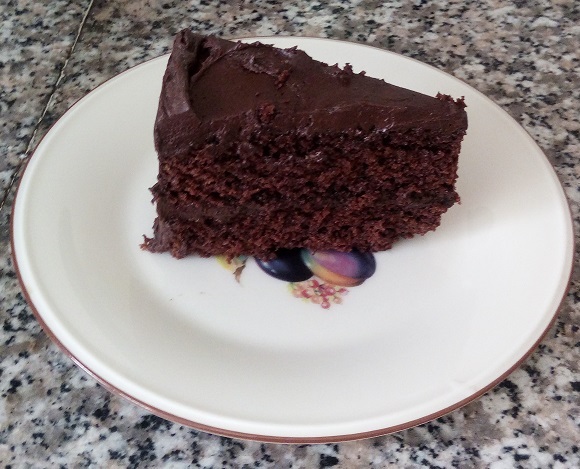 Everyone needs a standard chocolate cake recipe. I am always thankful I have an easy one for when I have to make a cake on short notice. That’s what happened this week when a friend’s dear husband passed away. The family was already filled up for meals when I went to sign up, so I did the next best thing, and made a cake, and brought it with two bottles of soft drinks, for the family and shiva crowd. The family hasn’t stopped raving about the cake and asked for the recipe, so I thought I’d share it here, as well. And no, that’s no mistake: the cake recipe calls for mayonnaise. This cake is so easy, you can mix it by hand, if you’ve got a good whisk. Just cool the cakes well before icing them. Sift flour, baking soda, cocoa, and salt. Mix mayonnaise, water, sugar, and vanilla. Fold in dry ingredients. Mix well. Divide batter into 2 greased and floured 8-inch layer pans. Bake 20-25 minutes in 375° Fahrenheit oven. Note: Makes 25-28 cupcakes, bake around 15 minutes. For 9”x13” pan, lower temperature to 350° and bake 35 minutes. Melt butter, margarine, or coconut oil (I do this in the microwave). Add cocoa, mixing until smooth. Add hot water or other hot liquid of choice (I use Riches Whip or coconut cream) and salt, then add vanilla. Beat in powdered sugar gradually, until thick enough to frost cake. You may not need all the sugar. Note: This icing is versatile. You make it thicker so you can squeeze it through a decorating tube or thin it to drizzle over a cake by adding more or less powdered sugar, or thinning with more liquid, a little bit at a time.